If you have uterine fibroids, you may be unsure of your treatment options. In the past, many doctors recommended a hysterectomy for fibroids, but a hysterectomy is no longer the only available treatment. Although a hysterectomy may be necessary for some patients, others can treat their fibroids using less invasive methods. Read on to learn more about various treatment options for uterine fibroids. Uterine fibroids are noncancerous growths that are classified according to where they grow: (i) There are four types of uterine fibroids. Submucosal fibroids grow inside the uterine cavity. Subserosal fibroids grow outside the uterus. Do I Need Treatment for My Fibroids? In some cases, fibroids can affect your fertility or cause pregnancy-related complications. (iii) If your fibroids are painful or interfering with your daily activities, you should seek medical evaluation. If I Need Treatment, Is a Hysterectomy My Only Option? Many women with fibroids would rather not undergo a hysterectomy. After all, a hysterectomy is an invasive fibroid removal surgery with a lengthy recovery time. Having the uterus removed can also be traumatic, particularly for women who were hoping to have children in the future. Fortunately, a hysterectomy is no longer your only option. (iv) In fact, most doctors now prefer to explore all other treatment options before resorting to a hysterectomy for fibroids. A variety of treatments can help preserve the health and function of your uterus. Like all treatment options, medications have their advantages and disadvantages. Your obstetrician-gynecologist (OBGYN) can help you determine if medication is the best treatment option for your fibroids. If medication isn’t an option, procedures to shrink or remove fibroids are available. Most patients can still become pregnant after a myomectomy, but some women who undergo a myomectomy may be at a higher risk for pregnancy-related complications. (i) Your OBGYN can help you weigh the risks to decide if this type of surgery will meet your needs. The procedure is associated with few risks, and most women recover quickly. However, women who undergo an endometrial ablation cannot become pregnant in the future. (i) If you aren’t planning to have more children, this procedure may be an option for you. If you want to preserve your fertility, you may need to consider another treatment. UFE is often performed on an outpatient basis. It produces little to no scarring and the risk is for complications. UFE recovery time is short, so it’s a good choice for patients who want to avoid an inpatient procedure at a hospital and a lengthy recovery. Luckily, a hysterectomy for fibroids isn’t your only option. Outpatient procedures like UFE can provide symptomatic relief without invasive surgery. At Azura Vascular Care, highly trained vascular specialists, registered nurses and medical professionals work together to provide coordinated, focused, best-in-class care in a safe, comfortable setting—adhering to the same rigorous standards and benchmarks as a hospital setting. Ready to learn more about your treatment options? 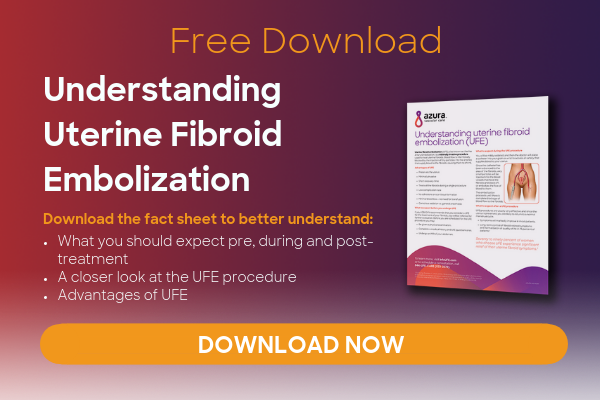 Download our free information sheet, Understanding Uterine Fibroid Embolization (UFE), or call 844-UFE-CARE (833-2273) today to schedule an appointment with a vascular specialist. (i) U.S. Department of Health & Human Services: Office on Women’s Health. (2018, March 16). Uterine fibroids. Retrieved December 7, 2018, from https://www.womenshealth.gov/a-z-topics/uterine-fibroids. (ii) Mayo Clinic. (2018, March 6). Uterine fibroids: Diagnosis & treatment. Retrieved December 7, 2018, from https://www.mayoclinic.org/diseases-conditions/uterine-fibroids/diagnosis-treatment/drc-20354294. (iii) Mayo Clinic. (2018, March 6). Uterine fibroids: Symptoms & causes. Retrieved December 7, 2018, from https://www.mayoclinic.org/diseases-conditions/uterine-fibroids/symptoms-causes/syc-20354288. (iv) U.S. Department of Health & Human Services: Office of Science Policy Analysis. (2018, June 30). Uterine fibroids. Retrieved December 7, 2018, https://report.nih.gov/nihfactsheets/viewfactsheet.aspx?csid=50. (v) Mayo Clinic. (2018, March 21). Uterine artery embolization. Retrieved December 7, 2018, from https://www.mayoclinic.org/tests-procedures/uterine-artery-embolization/about/pac-20384713.